Over two Sunday parades, cadets from 84 Squadron have been working hard to raise funds for the Squadron by taking up the ironing challenge. Cadet John Spelman was set the task to arrange a sponsored fundraiser and came up with the brilliant idea of offering a ironing service for the families and friends of the Squadron. Each item would cost just 50p or £1 for larger items such as sheets and the cadets would send them back home crease free and perfectly pristine. Cadet Spelman also decided to add a competitive element setting the challenge to each flight to raise the most funds. Green and Red flight went head to head with a little assistance from Orange flight split between them. The winners were Green Flight who raised £43.50. Red Flight's contributions of £35 brought the grand amount raised to £78.50! 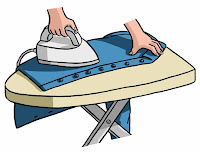 Afterwards, Cadet Spelman reflected that it had been a great success saying "not only have we managed to raise some funds, the cadets had fun learning about how to iron different items. The large duvet set from one parent was a bit of a challenge but we managed it!". The funds will go towards an upcoming planned visit to Bletchley Park. Thank you to all the families who sent in their items and payments.